HOME » JAPY FRERES, BIOGRAPHY, Markings, Year. © JAPY FRERES: BIOGRAPHY, HISTORY AND MARKINGS, YEAR. Today JAPY FRERES watches and clocks are still around because of the devellopment by industrializion the watch manufacturing industry. They produced many watches and clocks, estimated in the millions during a good 150 years. Frédéric Japy (1749-1812) was a pioneer in the "art" of industrialization and manufacturing, not only watches/ clocks, but of manufacturing in general. Watches/ clocks were made individual, by hand, by one or more people and then assembled. Like Ford did with cars, starting production lines for cars around 1900, at one place concentrated, Japy started already during 1770-1780 the same by manufacturing pocketwatches and clocks in basic production lines at one place, concentrated at Beaucourt (his native town) in France. In very short time the production was more then double the usual way. 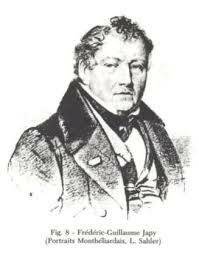 In 1806 three of his sons (Pierre,"Fritz" and Louis) took over the bussiness and founded the trademark "Japy Freres". The "golden age" to the japy freres dynasty was during the 1850-1930 years, by manufacturing watches/ clocks that the "common man" could buy. Japy Freres also created the machines or modified machines to do this. Because of production amount/ speed and lower prices Japy Freres got many contracts by different army's to deliver watches and clocks. 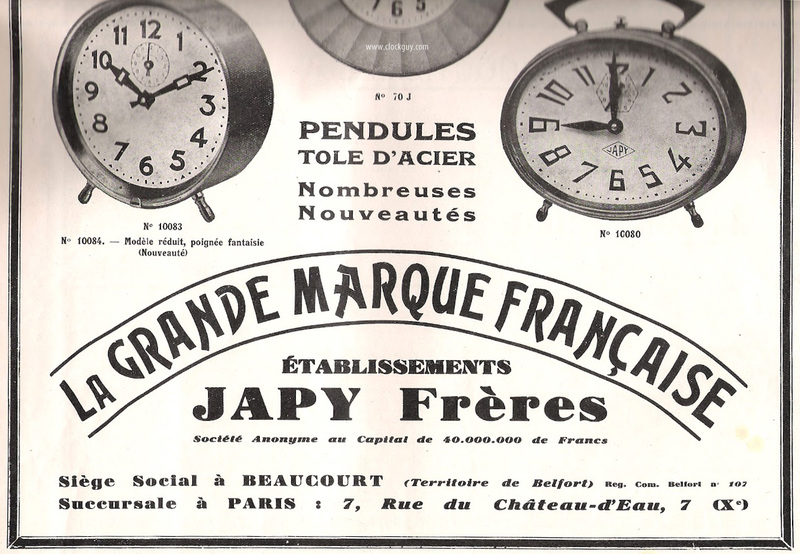 Japy Freres gave birth to the new standard for production: in his case this ment: watches, clocks, and later on emaille dials, and other things. Later on Frédéric's idea and interpretation of production lines became the industrial standard, as good as world wide. After his death in 1812 the factory went through his family untill the late 1930's, and ended there, as far it concerned watch/ clocks manufacturing. Edouard Louis Frédéric Japy 1749-1812 and his wife, Suzanne. FOUNDING "JAPY FRERES", 1806, BY THESE 3 BROTHERS, SONS OF FREDERIC AND SUZANNE. he was married to Louise Jenny Birckel.